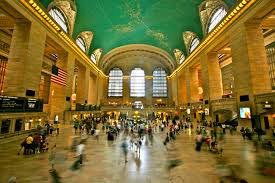 Grand Central Terminal | Custom & Private New York Tours, Inc.
It’s the largest terminal in the world with 44 platforms and 67 tracks and one of the only terminals with platforms on two levels. This massive 1913 neoclassic beaux arts edifice is a feat of engineering and aesthetic design that is truly most impressive, massive, majestic and spotless. This is the way terminals should be. Enjoy the folklore, Cornelius Vanderbilt, and how he gained control of every track entering Manhattan. What are the secrets of the constellation ceiling? What was the hole in the ceiling made for? Visit the food market and observe the “ballet” of New Yorkers scurrying to catch their trains. Lots to see, an amazing place! Shuushhhh! We won’t forget to stop at whispering arches! You’ll never guess what’s on the roof! Don’t omit New York City’s most impressive inside space and be sure to have a look at its magnificent facade as well.